Anthony’s IV Pizza and Pasta celebrates ‘Grand Re-Opening’ at new location in Morrisville Borough - Times Publishing Newspapers, Inc. If you’ve always enjoyed great pizza, pasta, sandwiches, salads and appetizers at Anthony’s IV Pizza and Pasta, you’ll especially enjoy dining at Anthony’s new location on 335 W. Bridge Street in the heart of Morrisville Borough. Anthony’s IV Pizza and Pasta celebrated its “Grand Re-Opening” on Valentine’s Day this year at its new home, the former Wagz Place. “We rented for 14 years in our old location. 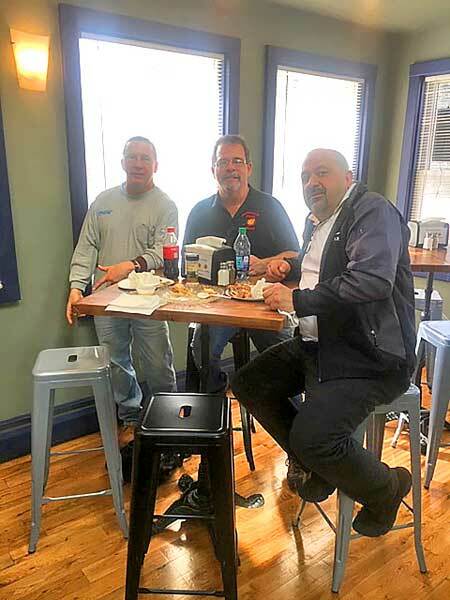 We bought this building and spent several months completely rebuilding it,” says Harry “the Chief Pizza Man” Hansberry, who co-owns the pizza parlor and restaurant with his wife, Heather, and his mother, Henny. Harry and Heather’s children, Haley and Harry, have also worked in the family business over the years. The Hansberry Family has lived in Morrisville for more than 25 years. After buying the pizza shop in 2004, the family-owned and operated business quickly became a popular place for locals to enjoy fresh, hot pizza of many varieties as well as other menu items. Specialty pizzas are offered in a mix of choices such as Sicilian or Trenton Style Tomato Pie to Margarita, Buffalo Chicken, Mexican or Broccoli & Garlic. Anthony’s many other menu selections include authentic, freshly made tacos of either pork, chicken or beef; pasta dishes such as baked ziti, vodka rigatoni, stuffed shells, or homemade lasagna. Anthony’s has many types of cheesesteaks, hoagies, strombolis, calzones, burgers, hot sandwiches, Buffalo wings and appetizers and sides including garlic knots, jalapeno peppers, onion rings, fried mushrooms, garlic parmesan fries, seasonal soups and much, much more! “We really enjoy our neighborhood and serving great food to our friends and family and all of our neighbors and visitors! Come visit and have a delicious meal and enjoy great service,” says Harry. The restaurant is open daily from 10:30 a.m. to 10 p.m. For more information or to view the menu, visit www.anthonys4pizza.com. Anthony’s offers delivery all day. To place an order, call 215-295-4699. “Like” them on Facebook @anthonysivpizza. Anthony’s IV Pizza and Pasta has ample on-site parking and is wheelchair accessible.